Sometimes brand-new costumes arrive from overseas ateliers reeking of tobacco smoke. Sometimes used costumes purchased from a fellow dancer arrive stinking of perspiration, stale perfume, cat urine, or other unpleasant smells. Even if the costume starts out smelling fresh, working dancers routinely need to care for the costume properly to avoid odor build-up over time, and after some gigs may need to remove food smells, perspiration odors, or tobacco smell. Whatever the cause of the odors, they can ruin the joy of wearing a beautiful costume. Here are some tips for controlling costume odors. Many working dancers will hand-sew felt linings into their new bra/belt sets before the first wearing, using a long, loose stitch. After this felt has absorbed enough perspiration to be unpleasant, it can be easily removed and replaced with fresh felt. There are several approaches that dancers use to remove smells from costumes. If one doesn't work, try another! I usually hear this recommended for perspiration odor, but you could try it with tobacco smoke to see if it helps with that. Mix equal parts of vodka and water in a spray bottle. Test a small amount on a hidden part of the costume to ensure it won't discolor the fabric or damage the decorations. Assuming it does no harm, spray this mixture on the part of the costume that smells. Let it dry. Vodka evaporates easily, so mix only a small amount at a time, just enough for the need of the moment. If the smell is strong, it may be necessary to repeat this for a total of 3-4 sprayings. Obtain a plastic tub with a lid. Fill it half full of fresh, clean cat litter. Wrap the costume in a pillow case, place that on top of the cat litter, and place the lid on the tub. Leave it there for 3-4 days. Some people find that Febreze is helpful in removing costume odors. It should first be tested on an inconspicuous part of the costume to ensure it won't stain the fabric or damage the decorations. Febreze has an odor of its own, and may provoke an allergic or asthmatic reaction in some people, so proceed with caution. Sunshine kills germs, and therefore can help remove perspiration odor or pet odors from costumes. Therefore, placing a costume outdoors may help. One caution: sunshine can cause fabric to fade, so this approach should not be overused. A single day of sunshine now and then probably will do no harm. Outdoor environments can pose other risks, such as damage to the costume from wind, bird droppings, or insects. Proceed with caution. Incense may not remove odors, but it can help mask them. Hang the costume, and burn incense below it. Hang the costume high enough to avoid smoke stains, and to avoid catching fire. People often use baking soda to remove odors from refrigerators. In some cases, it can help remove odors from costumes. Lavender has antibacterial properties, and may help kill bacteria that cause odors. Place fresh baking soda in several small fabric bags. Place several drops of lavender essential oil on cotton balls. Place the costume inside an airtight container, and arrange the bags of baking soda near the smelly areas. Add the cotton balls - it may be wise to place them on a small towel to avoid staining the costume with the oil. Seal the container and leave the costume in it for 3-4 days. Pet stores sell several products designed to remove animal smells such as cat urine. If a pet has caused the problem, one of these approaches may solve the problem. Cat owners embrace Nature's Miracle as a solution to cat urine smells. This product is an enzyme that breaks down the protein molecules. It may help with smells that are caused by pet accidents, but not with those caused by other sources. Before washing a costume, test a corner with some water to determine whether the color will run. Fabrics that were dyed in places such as India or Egypt may not have been fully rinsed, and the excess dye can run when the costume is washed. If this is the case, the costume should be washed separately, in a tub that won't be stained by the dye. Rubber gloves should be warn to avoid staining the hands with dye. It may help to hand-wash the costume in a bowl of water with gentle detergent such as baby shampoo, Woolite, or baking soda. The detergent should be tested on an inconspicuous spot on the costume before doing this to ensure it won't damage the fabric or the embellishments. Rhinestones may turn dark if washed, and may need to be replaced. Don't use too much detergent. Soapy detergents may stay in the fabric and dull it, while baking soda may leave a white residue. If the costume has visible perspiration stains, you may find it helpful to use the Carbona Stain Devil (#9) that is made for rust and perspiration stains. I don't know whether it would help remove the odor, but it should remove the visible stain. An old toothbrush can be used to carefully treat problem spots. Rubbing the fabric or wringing it may cause damage. It is safer to squeeze gently. Handle the costume cautiously while it is wet. Be careful to avoid letting it stretch under its own weight, and take care to avoid any snagging. Carefully spread it flat to dry. Dry thoroughly, to avoid any rusting of metal bits. Avoid washing in hot water or placing in a hot clothes dryer. These can cause the costume to shrink. Certain types of thread or embellishments such as soutache braid may shrink at a different rate than the costume fabric itself, causing puckering. Some fabrics may need to be ironed after washing. If this is the case, test the iron on an inconspicuous part of the costume to ensure it is not too hot. Dry cleaning does not remove smells or perspiration stains. Working dancers can avoid odor build-up in their costumes through proper costume care and storage. Never put a costume away when damp with perspiration. Spray the damp parts with the vodka/water mixture described above. Then place it flat until it dries. Put it away after drying. Never store a costume in an airtight container or a plastic bag. Instead, store it in a bag that will let it breathe, such as a pillow case, a packing cube, or a lingerie laundry bag. Fold costumes carefully before putting away. Never store the costume in a damp, humid environment. Mold and mildew smell is not attractive. Avoid storing the costume in a place where it can be damaged by pets (particularly pet stains) or children. Some people store a small fabric bag filled with baking soda in the bag or box with their costumes. It is also possible to use potpourri, but take care to avoid oils from the plants leaking out of the bag and staining the costume. Bellydance Television (BD-TV), Volume 1. Shira's review of a video that includes a segment on costume care. 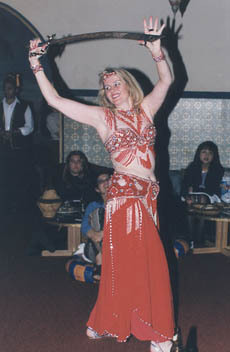 Tips & Tricks for Belly Dance Costuming. Includes tips on costume care.